Rare is an understatement when describing this luxury scenic estate property. An outstanding opportunity exists at this one-of-a-kind 3,383 sqft home where modern luxury & astounding construction meet, accompanied by breathtaking lake views. 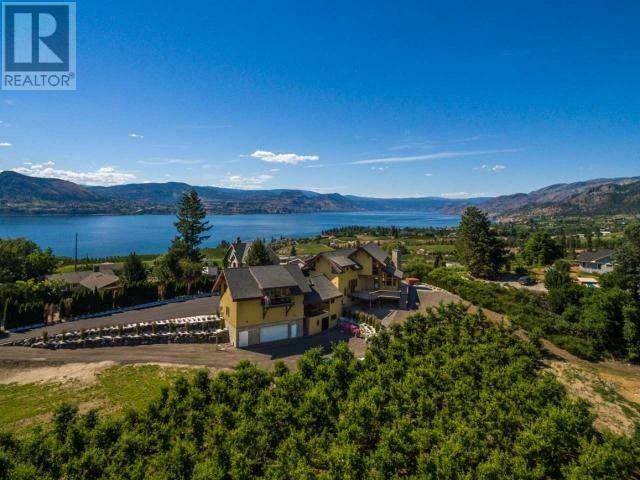 This custom built home emulates the finest craftsmanship and each detail is designed with elegance & class situated on a prime 3.98 acreage nestled amongst the orchards of the Naramata Bench. Hardwood vaulted ceilings combined with Euroline windows covering the entire front portion of the home showcases the commanding views! This home boasts reclaimed fir hardwood floors, hand-picked rockwork from local riverbeds, a Vantage lighting system, custom staircases, built-in sonos music system, solid stone sinks, custom stained glass & more! An exquisite 1,000 sqft suite is above the 3 bay heated garage leaving your guests in awe! Let this extensive living space leave a paramount feeling of sophistication. Welcome home! Dup List Agriculture #176297.